It’s a dog… It’s a raccoon… It’s a Tanuki! Some legends say the tanuki is a shape-shifter. Others describe the creature as a trickster god lurking in the woods. In Villa Incognito, a tanuki-centric novel by Tom Robbins – a trickster god in his own right – the story begins with this sentence: "It has been reported that Tanuki fell from the sky using his scrotum as a parachute." In reality, the tanuki or raccoon dog (Nyctereutes procyonoides) is just another mammal. It doesn’t even have a particularly large scrotum, sorry to say. However, what the raccoon dog lacks in supernatural powers, it more than makes up for in evolutionary abilities and backstory. (The creature also inspired what’s arguably the best power-up in the history of video games – the Tanooki Suit of Super Mario Bros 3.) But let’s lead off with the obvious ... the raccoon dog’s exceptional cuteness. Though it looks for all the world like a cousin of the raccoon (probably because of that Hamburglar mask), this animal is actually a canid. This places it in the same family as dogs, wolves and foxes. But that's where the similarities end. For starters, the raccoon dog’s bark is really more of a screech – exactly the noise you’d expect to hear coming out of a campground garbage can. It also has sharp claws that allow it to climb trees to an extent, which is totally weird, but not unheard of, for the dog family (the North American gray fox has also been known to get arboreal). And then there’s the fact that raccoon dogs hibernate. Neither canids nor raccoons do this. But if I had to choose one real-life superpower for the tanuki, it’d simply be survival. This creature is built for the long haul. It eats basically anything alive or dead, pumps out 8-10 pups at a time and has a serious case of wanderlust. One study found tanukis disperse up to 300 kilometers a year. Look at a map of raccoon dog distribution and you’ll see that the little buggers can be found from the misty forests of southern Japan on up to the edge of the Arctic Circle in Finland. But while it’s true that raccoon dogs have successfully adapted to myriad climates and ecosystems across Eurasia, their presence in Europe is anything but natural – they’re actually an invasive species. And the blame lies solely at the feet of the former Soviet Union. According to Kaarina Kauhala, a senior research scientist at the Finnish Game and Fisheries Research Institute, the Soviets imported raccoon dogs to benefit the fur trade. The first pregnant females were brought into what is now Georgia and Azerbaijan in 1928, where they were bred in fur farms. Now, you might presume a few of the raccoon dogs must have escaped their captive life to colonise a new continent. Wrong. The Soviets actually released them into the wild. Deliberately. Again and again and again. Kauhala documents this process in a paper published in Current Zoology in 2011. She says that between 1929 and 1955, the Soviets released nearly 10,000 raccoon dogs across the Caucasus and on up through Ukraine, Moldavia, Estonia, Finland and Belarus. Basically, they employed an 'Oprah strategy' across their Western front: You get a tanuki! And you get a tanuki! Everybody gets a tanuki! Today, it’s difficult to find a European nation that doesn’t have a sizeable population of raccoon dogs. They're now the most common medium-sized carnivores in Finland and one was spotted as far away as southern Spain in 2008. It’s as though the tanukis unfurled their great scrotums like a sail and started soaring across Europe. 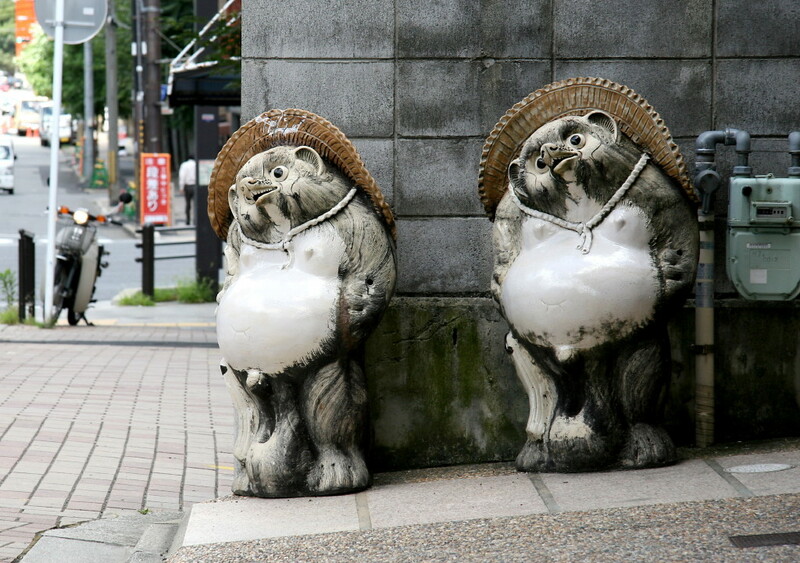 Ok, by now you’re wondering what the deal is with all this scrotum talk, so I’ll leave you with this: while the animal itself doesn’t boast any outsized anatomy, the tanuki’s scrotum has become a symbol of wealth and fortune in Japan. And at one point in the 19th century it was popular to depict the tanuki’s sack as a billowing, multitasking appendage perfect for catching birds, smacking catfish and creating shade on a hot summer’s day. So if you ever visit a restaurant in Asia and a well-endowed tanuki statue greets you at the door, don’t blush. It’s an omen of good luck. And as with rubbing the belly of the Buddha, a quick caress could improve your chances of financial fortune. Okay, I might have made that last part up. Or did I? For researcher Dr Olav Oftedal, milking strange animals is nothing new, but when he set off to milk naked mole-rats, he was in for a few surprises. The animal kingdom is rife with imitation and trickery … and these male ruff birds are great at both.